Building upon this foundation, we are preparing our students with the knowledge and skills necessary for success in college and/or a career. Our curriculum follows Arizona’s Common Core Standards in literacy and math. These standards teach concepts using critical-thinking and problem solving skills and by encouraging the development of effective communication. If you would like more information about what your child will be learning at Taylor, please visit Common Core Standards or give us a call. We’d be happy to help. Taylor Intermediate School qualifies for extended federal aid as part of the Title I program. This program ensures that our students receive the education and support they need to excel across the curriculum. We use federal funds to hire highly qualified teachers, provide for technology/curriculum improvements and training, and encourage parental involvement and volunteerism. To learn more, visit the U.S. Department of Education’s website. Taylor Intermediate School participates in the National School Lunch Program, providing nutritious meals to students at prices our families can afford. We serve both breakfast and lunch daily. For your convenience, please set up a “My Lunch Money” account to track and pay for your child’s meals. We serve breakfast every morning in the school cafeteria from 7:30 a.m. to 7: 50 a.m. Participating students (including bus riders) must purchase breakfast by 7:40 a.m. to ensure they have enough time to eat without being tardy to class. We serve lunch every day in the school cafeteria between 11:40 a.m. and 12:25 p.m. Parents are welcome to join us occasionally for lunch. If you would like to visit your child during his/her lunch hour, please call the front office before 8:00 a.m. to verify their class lunch time and place your order for lunch. We are excited for the 2018–19 school year. 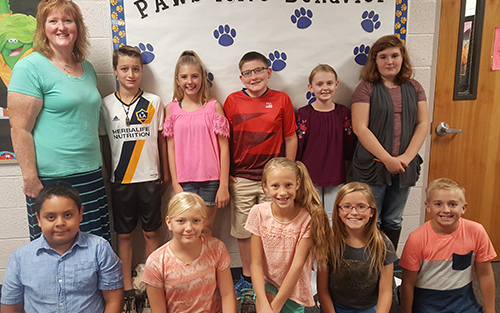 Our student council members for the 2018–19 school year are listed below. School Hours: 7:55 a.m.–1:10 p.m.
Each student is entitled to the highest quality educational opportunities. Education must advance the self-esteem, growth, and integrity of all students. Education is the shared responsibility of the student, home, school, and community. There is power in the integrated approach to teaching and learning. Everyone can learn and be successful.